I aim to keep as much as possible on this site original, but couldn’t resist showing these two record shop bags which turned up on a dealer’s site recently. The guy was offering some pristine original Beatles albums first editions, which someone had purchased in the famous NEMS record store in Liverpool and kept in the store bags all this time. I’ve as much regard for The Beatles as anyone interested in popular music (despite our old – and much missed – evening class lecturer Bruce Thomson, who used to run down their importance every time he wanted to generate some spirited discussion! ), but I’ve never wanted to collect their records. Yet if someone put one of these up for sale I’d be really keen (the dealer in this case would not separate them from the records, I asked. Well at least I assume this was the case from the deafening silence). 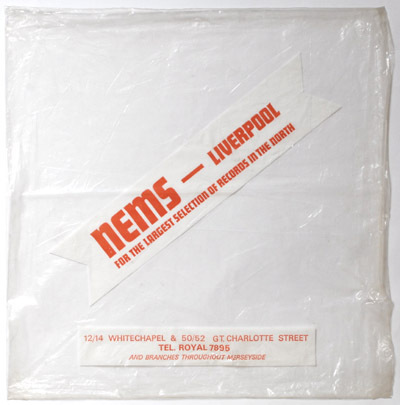 NEMS was short for North End Music Stores, and it grew out of an expanding family furniture shop in Liverpool. They sold musical instruments and of course records. 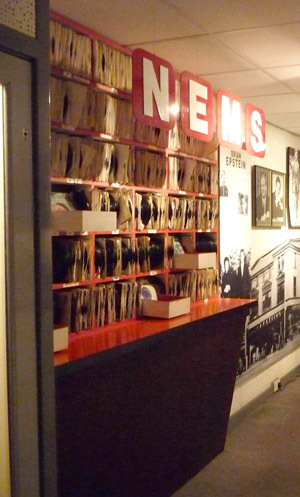 Brian Epstein famously joined the family business in the late 50s and was put in charge of the record department of the newly-opened NEMS music store on Great Charlotte Street. Under his guidance it became one of the biggest musical retail outlets in the North of England. A more modern branch opened before long and they eventually advertised branches across Merseyside. It’s not a place I ever got to see; I didn’t get to Liverpool until the mid-70s and it’s interesting to imagine what it was all like and then see the day to day mundanity of this vintage picture. 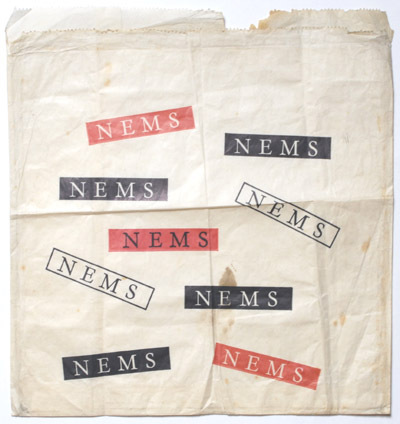 Indeed my first encounter with NEMS was probably their record label in the 70s. It was from here that Epstein got to meet The Beatles (who used to frequent the shop) and the rest you probably know. These bags are a direct link back to those days. What the heck, I’m off back to the dealer’s site to see how much he wants. Maybe I can then sell the record off separately! I saw on Ebay two other shop bags in excellent vintage condition. I was outbid at the auction but I saved the pictures. They are very nice, great designing art. I also have one in my Beatles’ collection, but not in great shape, though. Let me know if you want the pictures for your website. Hi, I am Jeff of the FB-page BEATLES FOREVER, could you please post these pictures on this FB-page? It would be of great interest for ALL Beatles fans, thanks! I’m not too clever on Facebook Jeff; why not just put a link to the page from your site? Nice! Any more stories about the shop Mrs. Holmes? Very cool. Would I be correct in deducing that the location is now used for the Bella Italia Restaurant? On Google StreetView, you can match the above-ground windows with those of an old photo of NEMS. I think the whole block has recently been demolished Josh. Hard though it is to believe, given how much tourist income The Beatles bring to Liverpool still. 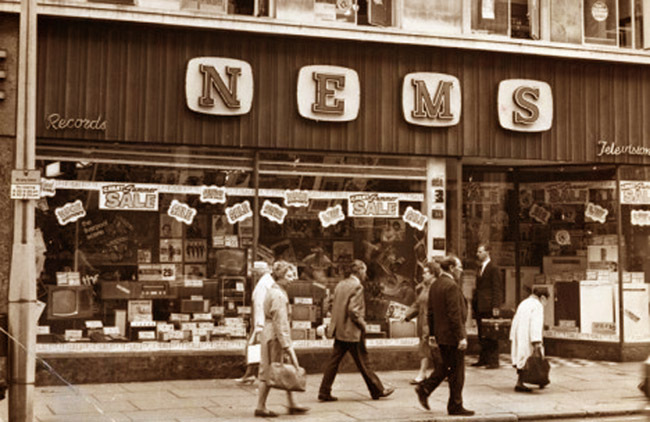 I worked at Nems Liverpool in the 60s on both shops Whitechapel and Great Charlotte Street, then went on to manage County Road shop. Fascinating Lynn, do you have any photo of the time? Thanks for this John. I dropped them a line and they have saved them for me, and I’m popping over to buy a couple this week! Glad to be of help Simon.